Monitoring and controlling of substations are essential task for supplying healthy power to the consumers in this automated era. Depending on the voltage levels and end users, there are transmission or distribution substations those supply electrical power to various loads. Remote monitoring and control make these substations to be operated through wireless communication technologies like GSM, GPRS, Ethernet, etc. Substations consist of various equipment like transformers, circuit breakers, relays, APFC panels, etc., and these equipment ought to be operated in such a way that the loads must be delivered safely with specified parameters. These parameters include voltage, current, frequency, power factor, temperature, and so on. 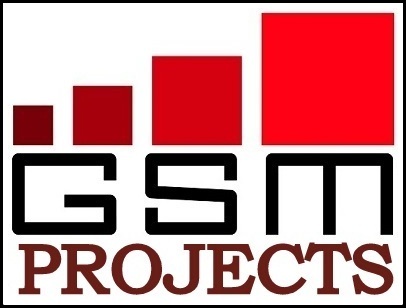 This system acquires a remote substation’s parameters like voltage, current, frequency, etc., via GSM network using GSM modem or mobile. It allows the remote operator to operate relays, circuit breakers and buzzers, and facilitates the display of various parameters in the LCD that is interfaced to the microcontroller. 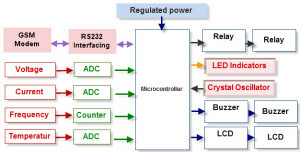 In this project a microcontroller acts as a central controlling device that accepts the inputs and correspondingly controls the outputs, as shown in the above figure. The microcontroller is programmed in such a way that it sends the input parameters in the field side to a remote GSM mobile through the GSM networks, periodically. Similarly, it receives the control signals that are sent from the operators, and in accordance with those signals, it controls the relays and buzzers. At times when current exceeds their limits, the microcontroller automatically trips the circuit breakers and sends that information to the user by SMS. 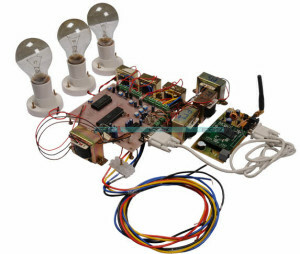 Thus, this is a simple and low-cost type of GSM-based project that helps students to get a basic idea about the substation automation. With this system, a user can add more than two mobile numbers to receive and control the substation equipment. This project is a high-cost and more reliable project when compared to the microcontroller project that we have discussed above. The system here uses PLC (Programmable Logic Controller) as a Remote Terminal Unit (RTU) to control and take the inputs similar to the microcontroller of the above mentioned project. The above figure displays the arrangement of the whole system in a substation automation. In a substation, a PLC collects all the input parameters, and with the help of the communication devices, such as GSM/GPRS modem, it transfers the data to remote devices like mobiles, PCs, etc. If any electrical fault occurs, the PLC automatically trips the relays and the circuit breakers. This project also deals with the SCADA software to monitor and control the field parameters graphically in the control room PCs. This project not only allows users to receive substation parameters through SMS periodically, but also accepts the messages from the users to actuate the final control devices. The CompactRIO module is a real-time hardware as it consists of Analog/Digital input modules to gather all the substation input parameters, the output/Relay modules to control the equipment and communication, and the modules to connect various communication devices in the substation. Along with this, the GSM/GPRS modem sends and receives signals to and from the mobiles, PCs and other final information users. The Automatic Meter Reading system uses the LabVIEW software, which is a graphical language software used for monitoring and controlling substation parameters like the SCADA application mentioned in the above project. 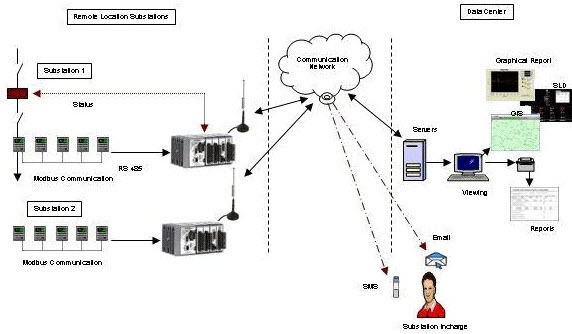 It allows users to connect to two or more substations through the strong communication links. This system is costlier than the above two projects. However, it provides real-time access for controlling and monitoring the substation. As an example, after acquiring the complete data of distribution transformer at substation through GSM, we have designed the following project. This project is proposed to acquire the parameters like voltage, current, temperature, moisture content, vibrations, etc. 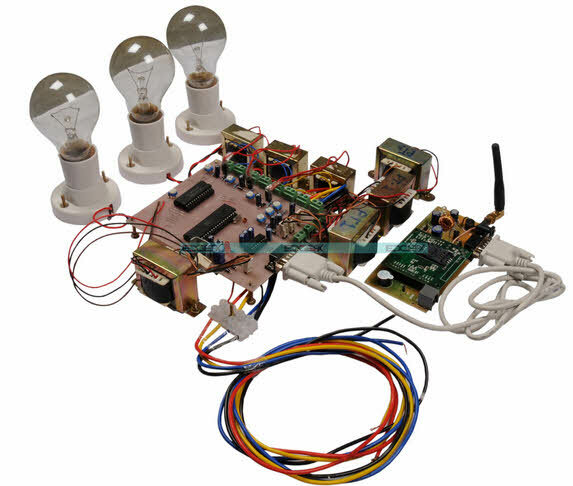 This ‘GSM-based Remote Monitoring of Transformer Parameters’ uses a microcontroller to collect the parameters, and then sends these parameters to a GSM modem via a level shifter IC. The Receiver side also contains GSM to send and receive the data. For further details and information about this project, one can search the links given here. This is all about the three methods of GSM-based projects that are proposed to control and monitor substations. These are all real-time projects currently many of the substations are equipped with. You can compare these three and write which is the best and more reliable project for the current automated substation in the comments section given below. I need the information about the controlling of substation by using arduino mega 2560 micro controller and Ethernet sheild..And also i need reference papers regarding this topic. plz suggest some new idea about electrical project for final year. sir I want to model of Microcontroller-Based Substation Monitoring and Control System with GSM Modem for automatic reclousure system . i am student of EE and i need the microcontroller 8051 based system monitering generetor/transformer without using GSM…and refrences too. CAN U PLEASE PROVIDE circuit diagram for connection of the project….